We’ve certainly seen our share of mash-ups with our PixArt pieces. All of them have been fun homages to the many worlds of Pixar characters. This month’s first feature is no different. 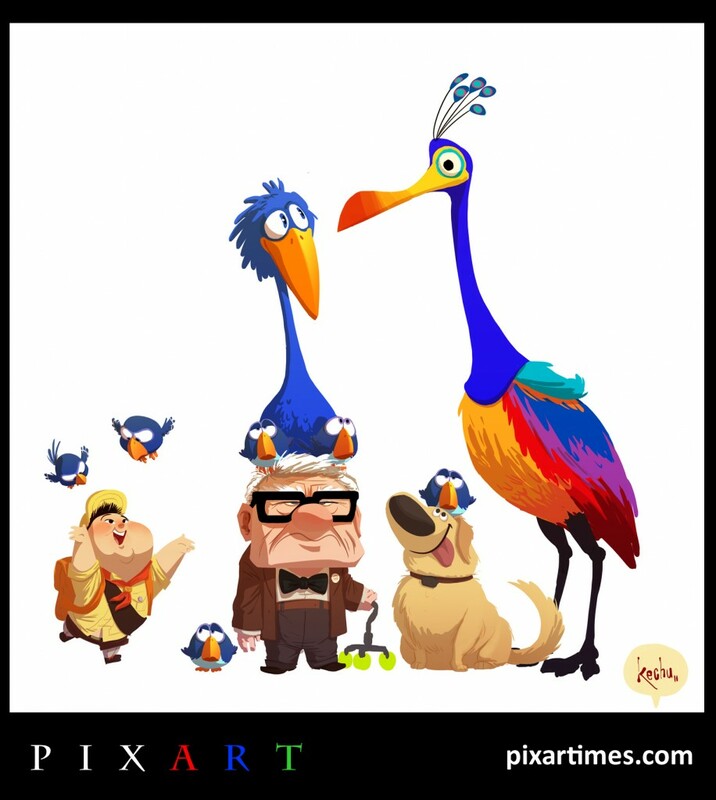 Argentinian artist Sergio Kechu brings us this colorful piece featuring the characters from Up and the short For The Birds. Make sure to check out Sergio’s website and blog. He’s got some gorgeous character designs and illustrations. I must admit, I couldn’t read a word of it, but the beautiful images speak for themselves. Keep on reading to learn more about Sergio and his great piece! Oz Land or Slumberland! And If I had to decide a place here on Earth, I think Barcelona, Paris or London would be okay too. The Incredibles and Ratatouille – Brad Bird is one of my favorite directors. Monsters, Inc. is great too. Carl Fredricksen, Mike Wazowski, and Syndrome. The birds from For the Birds are visiting their friend Kevin, who was casually taking a walk with Carl, Rusell and Dug on a white background. I think that Carl is not very happy for this meet, especially because these birds find his head quite comfortable. Books, holidays, and the internet. Don´t smoke in a gas station and eat all your vegetables. A lot of artbooks don´t make a good artist – practice does! I have worked in animation for almost 14 years. I would like contact with studios who are interested in freelance for character design and storyboards. I work in graphic novels too. You will find some on my blog. Big thanks to Sergio for contributing this wonderful piece! View all our PixArt pieces here.